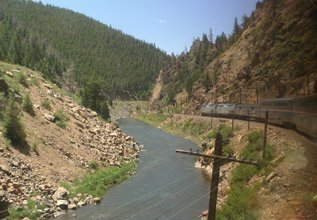 Coast to coast by train across the USA: This is the view from the dining-car as the most scenic train of all, the California Zephyr, rolls through a Colorado canyon. You'd be crazy to fly! Courtesy Sue Smith. What are Amtrak trains like? This route map shows where Amtrak trains run. Each of the very long-distance transcontinental routes shown in blue has one daily train, except for New York to Florida with 2 trains a day and the Sunset Limited (New Orleans-San Antonio-Los Angeles) which runs 3 times a week. Important short distance routes (for example, Washington-New York-Boston or Los Angeles-San Diego) have regular intercity services and are shown in red. It's easy to check Amtrak train times at www.amtrak.com, just use their online booking system. Click here for a more detailed Amtrak route map. Amtrak, see www.amtrak.com for US train times, fares & online booking. See the Queen Mary 2 page. New York: GMT-5 Chicago: GMT-6 Los Angeles: GMT-8 Clocks go forward 1 hour from 2nd Sunday in March to 1st Sunday in November. Coast to coast, 3,397 miles from New York to San Francisco in 3 days by train, a journey of a lifetime for as little as $232. This video gives a taste of what you miss when you fly, it shows the scenery in Colorado's canyons from Amtrak's 'California Zephyr', perhaps the most scenic of their routes across the States. A chance to chill out & experience America at ground level, yet it costs no more than a flight. Coast to coast by train, in pictures. The 3,000 mile journey across the United States by train is one of the world's greatest travel experiences. It's easy, comfortable, safe, and an affordable alternative to flying. Free route guides are available on board each train, telling you what to look out for from the window, and the scenery on many routes is world class. The 3,000 mile coast-to-coast train ride takes 3 nights, without stopovers. Choose from 4 or 5 different routes, each with their own character - I explain the most scenic routes below with train times & description. By all means stop off on the way, but remember that a separate ticket/reservation is needed for each leg. It takes one night from New York, Boston or Washington DC to Chicago where you change trains, then two nights from Chicago to Los Angeles, San Francisco or Seattle on a superb double-deck Superliner train. You can also travel coast to coast via New Orleans, this takes an extra night as you need to spend a night in New Orleans. Most of the trains run daily all year round, although the New Orleans-LA train only operates three times a week. 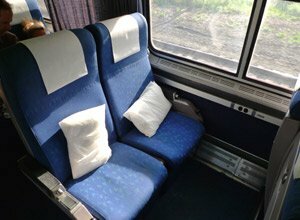 If you book online at www.amtrak.com, fares from New York to Los Angeles, San Francisco or Seattle start at just $232 in a spacious reclining seat, surely one of the world's greatest travel bargains. A private sleeper for 1 or 2 people can be added to your booking, the extra cost is often quite hefty but the sleeper room charge includes all meals in the dining-car as well as tea, coffee & fruit juice throughout the trip. 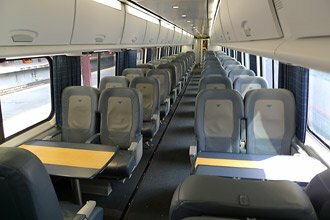 Amtrak's spacious trains also have dining-cars and lounge cars, open to both seat and sleeper passengers. See descriptions of the trains here. Also check out the coast to coast packages at www.amtrakvacations.com. On-time performance... Bear in mind that these trains run for over 2,000 miles, although they often arrive on time or perhaps half an hour late, they can sometimes arrive an hour or two late or more, so don't book any tight connections. You can see how your chosen trains have performed the last few weeks using www.amtrak.com/historical-on-time-performance and you can also see real-time train positions & performance at www.asm.transitdocs.com. Which is the best train route across America? Each of Amtrak's trans-continental routes has its own distinctive character, even if the trains themselves are the same. But if you have a choice, one route stands out as the most spectacular for both scenery & historical significance. This is the California Zephyr from Chicago to San Francisco, which you can take in connection with the Lake Shore Limited from New York or Boston to Chicago, or the Capitol Limited from Washington DC to Chicago. The California Zephyr is one of world's greatest train journeys, and in around 48 hours you will cross the farmlands of Nebraska, scale the Rockies beyond Denver while you eat egg & bacon for breakfast in the diner, snake through rocky river valleys in Colorado and pass through the Sierra Nevada mountains to reach Sacramento and the San Francisco Bay area. The route covers much of the very first historic trans-continental railroad route, and there's a commentary for the most significant section. 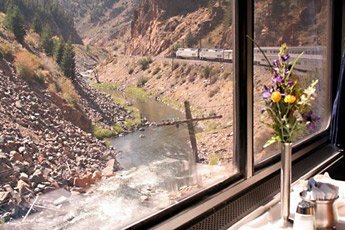 To give you an idea of what a coast to coast train ride is like on this route, see the California Zephyr page. or for a snapshot of what it's like sipping a cocktail in the sightseer lounge on the California Zephyr as it passes through Colorado, click here. However, all the trans-continental routes are scenic, and the Southwest Chief, for example, will take you from Chicago to Los Angeles over the famous Santa Fe railroad, alongside the equally famous Route 66, through Navajo Indian country, another amazing trip, with a chance to stop off at the Grand Canyon on the way. * The California Zephyr terminates in Emeryville and an Amtrak Thruway bus transfers passengers across the Bay Bridge to the Temporary Transbay Terminal in downtown San Francisco. Tickets can be booked through to (and luggage checked through to) San Francisco Transbay Terminal as if it was a rail station. ** The Chicago-Los Angles portion only runs 3 times a week, departing Chicago on Tuesdays, Fridays & Sundays. Daily Chicago-San Antonio. Use these times as a guide, always check current times & fares at www.amtrak.com as they change from time to time. 1. Take a daily Superliner train to Chicago. 2. Take a daily train east from Chicago. * The California Zephyr starts in Emeryville. An Amtrak Thruway bus links the Transbay Terminal in downtown San Francisco with Emeryville across the Bay Bridge. Tickets can be booked through from (and luggage checked in at) the Amtrak station at San Francisco Transbay Terminal as if it was a rail station. *** The Los Angles to Chicago portion only runs 3 times a week, leaving LA on Wednesdays, Fridays & Sundays. Daily San Antonio-Chicago. New York & Washington DC - Chicago via Indianapolis, 3 times a week. (one night). Amfleet reclining seats, Viewliner sleeping-car. A slower train than the Lake Shore Limited, and it only runs 3 times a week. No full diner, only a cafe car. But a useful alternative through great scenery if the Lake Shore is full. Washington DC - Chicago daily (764 miles, one night). Superliner train with reclining seats, observation-lounge-cafe car & sleeping-cars. The dining-car was discontinued from June 2018, sleeper passengers get a cold tray meal served in their compartment, other passengers can use the cafe-lounge car. Chicago-San Francisco daily (2,438 miles, two nights). Superliner train with reclining seats, sightseer lounge car, sleeping-cars & dining-car. This train is one of the great train rides of the world, and if you are planning a coast-to-coast trip, this is the best route to take. It climbs through the Rockies between Denver & Salt Lake City, and through the Sierra Nevada between Reno and the Bay Area. Illustrated account of a journey on the California Zephyr. Chicago - Seattle/Portland (2,206 miles Chicago-Seattle, two nights). Superliner train with reclining seats, sightseer lounge car, sleeping-cars & dining-car. This train winds its way past Glacier National Park and through the mountains of Washington state. New York - Chicago daily (959 miles, one night), with through cars Boston - Chicago daily. Amfleet reclining seats, Viewliner sleeping-cars, Amfleet lounge-café. This train takes the scenic route up the Hudson River out of New York, with the train tracks running right alongside the river, past Storm King Mountain and West Point Military Academy. Try and get a seat on the left-hand side of the train out of New York, right-hand side heading to New York. The Boston-Chicago & New York-Chicago sections are coupled together between Albany & Chicago. Illustrated account of a journey on the Lake Shore Limited. The dining-car was discontinued from June 2018, sleeper passengers get a cold tray meal served in their compartment, other passengers can use the cafe-lounge car. Chicago - Los Angeles (2,256 miles, two nights). Superliner train with reclining seats, sightseer lounge car, sleeping-cars & dining-car. This train mostly travels via the Santa Fe railroad, once used by the famous Chicago-Los Angeles 'Super Chief', the film stars' favourite. It will take you through Apache Canyon and right through Navajo Indian country, with a live commentary from an Indian guide over the train's public address for the relevant section of line. 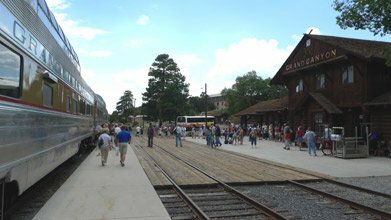 The train serves Flagstaff which is one hour by connecting bus from the Grand Canyon, with day tours available, and Williams, for the Grand Canyon Railway. Runs daily Chicago - Dallas - San Antonio, but only three times a week between Chicago & Los Angeles (westbound from Chicago on Tuesdays, Thursdays & Sundays, eastbound from LA on Wednesdays, Fridays & Sundays). Superliner train with reclining seats, sightseer lounge car, sleeping-cars & dining-car. 2,728 miles Chicago-LA. Click here to see what the trains are actually like inside & out, and to understand the sleeping-car, lounge & dining facilities. 3,000 miles coast-to-coast overland for as little at $186 (£153) has to be one of the world's greatest travel bargains! Railpass options. Amtrak fares are dynamic, so you'll see various prices on various dates, book ahead for the cheapest prices - these are the cheapest examples, if you book ahead. Round trip fares are twice the one-way fare. Children 2-12 (inclusive) travel at reduced fare, children under 2 travel free (limit one child under 2 per adult). There's a 10% discount for seniors over 65 on some fares. The discount applies to the base fare but not to saver fares, flexible fares, roomette/bedroom charges. If you choose to travel in a sleeper, the premium fare column on the Amtrak website will show the total cost for all passengers travelling in a roomette or bedroom. This is calculated as a basic fare for each passenger plus one charge covering the whole roomette or bedroom. The roomette or bedroom cost is the same whether it's occupied by one person or two. So a sleeper is a lot better value if there are two of you! The two people price in the table above is the total you pay for two people sharing a roomette or bedroom. Tip: You can save 10% on the basic travel fare (but not on accommodation supplements) by becoming a member of the National Association of Railroad Passengers, which at the time of writing costs $35 for an individual or $50 for a family. It can pay for itself on one coast to coast trip. See www.narprail.org for full details and online sign-up. Yes of course, but if you want to stop off you'll need to buy separate tickets for each leg. To book a coast to coast trip with stopovers at any cities you want, simply look for the 'Multi-City' link at top right of the booking form on www.amtrak.com. This allows you to book a trip with up to 4 segments, and of course you can book additional segments as separate bookings. However, if you buy a through ticket at the cheapest price between an East Coast city such as New York and a West Coast city such as Los Angeles, then no, you cannot stop off, you must travel direct on your assigned trains. Although the several hours between trains in Chicago is often time enough to climb the Sears Tower (now owned by the Willis corporation, see www.theskydeck.com) and get great views over the city, it's only 5 minutes walk from Chicago Union Station! As you can see from the fares table above, separate tickets New York to Chicago and Chicago-Los Angeles (so you can stop off in Chicago) work out about $35 more expensive than a New York to Los Angeles through ticket. 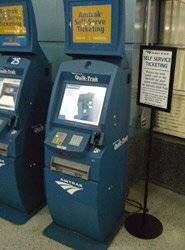 Amtrak's Quik-Trak self-service ticket machines: You simply pass the barcode on your booking printout under the machine's scanner. It will ask you to confirm the journey , then simply click 'print' to print your tickets. However, Amtrak has now introduced e-tickets, and with these you can go straight to the train. All the trains shown here offer checked baggage. All passengers (both coach & sleeper) are entitled to check in up to 2 large items of luggage free of charge, plus an additional 2 large items for $20 each. Maximum 50lbs (23Kg) per item, maximum total linear dimension (length + height + width) = 75". Oversize bags (up to a total linear dimension of 100") $20 per bag. A name and address label must be attached to each item. Hand luggage is limited to two items per passenger, maximum 50lbs (23Kg) per item, dimensions 28" x 22" x 14". See www.amtrak.com/baggage-policy. You can check bags through to your final destination, so for example if you have a New York to San Francisco ticket you can check your bags in at New York all the way to San Francisco Transbay Terminal. They will be transferred for you from train to train in Chicago and from train to bus at Emeryville, leaving you free of it until you arrive. Anyone from any country can buy tickets online at Amtrak's website www.amtrak.com. An e-ticket will be emailed to you or you can collect tickets any time before departure at a Quik Trak self-service machine or at a ticket counter. Booking opens 11 months in advance. With a print-at-home e-ticket you can go straight onto the train. If you choose to use a Quik-Trak machine, simply pass the barcode on your booking printout under the scanner and click the touch screen to print your tickets. Find the cheapest fares... If you want to see which departure dates have the cheapest fares, go to http://biketrain.net/amsnag/amSnag.php and enter a journey and a 30-day date range to find the price for a seat or sleeper on each date, to find the date with the cheapest fares. To enter the journey you'll need to use Amtrak's 3-letter station codes (for example, New York Penn Station is NYP, Los Angles is LAX), you can find the codes by using the journey planner at www.amtrak.com. You can call Amtrak 24 hours a day on 1-800-USA RAIL. You are emailed an e-ticket or can pick up tickets at the station. From outside of the USA, Amtrak's international desk is + 1-215-856-7952. Open Mon-Fri 08:30-16:00 Eastern Time. Lines open 09:00-22:00 Monday-Friday & 09:00-17:30 Saturday, Eastern Time (5 hours behind the UK). From the UK call 020 3327 3500 or visit www.amtrakvacations.co.uk. ...as part of a holiday with Railbookers. 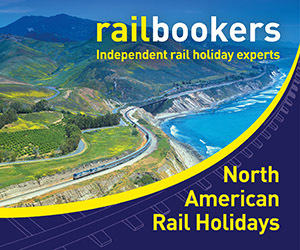 If you want a train travel expert to arrange a coast to coast holiday for you, with trains, stopovers, hotels, transfers and (if necessary) flights all sorted, train travel specialist Railbookers can arrange coast to coast tours by train to your own specification. Just tell them what you want (or ask them for their advice & suggestions) and they can make all your arrangements. If you'd like to travel with a convivial group of travellers escorted by a professional tour guide, contact Great Rail Journeys at www.greatrail.com, in the UK call 01904 527 120. They have tours leaving New York for LA & San Francisco between 1 and 5 times each month from April to October. If you live in the USA, you can also book escorted tours at www.amtrakvacations.com, call toll-free 800-268-7252. A USA Railpass is available covering the whole Amtrak network or just parts of it, see advice on USA Railpasses here. See an illustrated account of a train ride from New York to San Francisco on Amtrak's Lake Shore Limited and California Zephyr. The California Zephyr, just arrived in Emeryville after its 2,438-mile run from Chicago, 10 minutes ahead of schedule. New York-New Orleans daily (1,377 miles, one night). 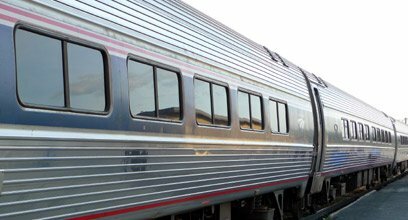 Amfleet reclining seats, Viewliner sleeping-cars, Amfleet lounge-café & heritage dining-car. Runs 3 times a week. New Orleans - Los Angeles 1,995 miles, 2 nights. Superliner train with reclining seats, sightseer lounge car, sleeping-cars & dining-car. Amtrak fares vary dynamically, so you'll see various fares on various dates, book ahead for the cheapest prices - these are just typical examples, assuming you book ahead. Luggage arrangements. Railpass options. Can I stop off? See the How to buy tickets section above. 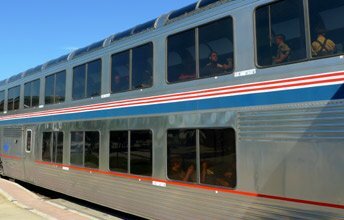 Silver Meteor: Amfleet reclining seats, Viewliner sleeping-car, heritage dining-car. Silver Star: Amfleet reclining seats, Viewliner sleeping-car, Amfleet cafe car. No dining-car. 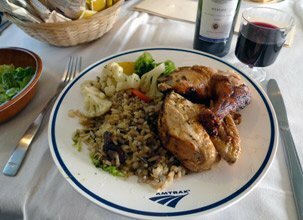 Tip: Take the civilised Silver Meteor with dining-car if you can. The Silver Star has one overworked cafe car and no dining-car. You can buy tickets online at www.amtrak.com, just click on 'Reservations'. You can choose to have an e-ticket emailed to you, or can pick up the tickets at the station before departure. If you live in the UK, Ireland or elsewhere in Europe, you can buy Amtrak tickets by phone from International Rail, call 0844 248 248 3. From outside the UK +44 844 248 248 3. Lines open 09:00-17:00 Monday-Friday. If you live in Australia or New Zealand, you can buy Amtrak city to city tickets online at InternationalRail.com.au. Tickets sent to any address. 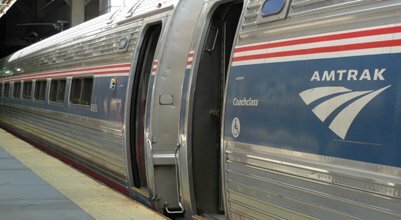 Once in the USA, you can book online at www.amtrak.com or call Amtrak 24 hours a day on 1-800-USA RAIL, picking up your tickets at the station on departure. A fast and frequent inter-city service links Boston, New York, Newark, Philadelphia, Baltimore and Washington DC. New York to Washington takes as little as 2 hours 48 minutes, New York to Boston just 3 hours 30 minutes. There are two types of train: Acela Express 150mph high-speed trains with 1st class & business class (premium fares apply) and regular trains with coach class and (in most cases) business class. There are also services from Boston to Portland (Maine) and from Philadelphia to Harrisburg. See www.amtrak.com for times, fares and online booking. Fares vary like air fares, with cheaper prices available the further ahead you book. Round trip fares are twice the one-way fare. Children 2-12 (inclusive) travel at reduced fare (except on Acela Express where there is no discount for children on weekdays), children under 2 travel free (limit one child under 2 per adult). Luggage on Washington-New York-Boston trains: These trains don't have checked baggage, you simply take your luggage with you onto the train and put it on the racks just as you would on any European train. You can take 2 items up to 23Kg each, plus two smaller personal bags each up to 11Kg - pretty generous, see www.amtrak.com/baggage-policy. You can buy tickets online at www.amtrak.com. You can choose to have an e-ticket emailed to you, or can pick up the tickets at the station before departure. If you live in the UK or Ireland, you can buy Amtrak city to city tickets online from International Rail. Tickets sent to any address in Europe. Acela Express travels at up to 150mph, and has first class & business class. There's no coach class, and premium fares apply, with no discounts for children on weekdays. Cheaper but slower than Acela Express, with coach class & business class between Boston, New York, Philadelphia, Baltimore & Washington DC. Three daily trains link New York via Albany with Niagara Falls. Journey time is a leisurely 8 hours 30 minutes, a relaxing journey along the Hudson River Valley out of New York, past Storm King Mountain and West Point Military Academy, a very scenic route, highly recommended. See www.amtrak.com for times, fares and online booking. A daily train called the Maple Leaf links New York with Toronto via Niagara Falls, and another daily train called the Adirondack links New York with Montreal via the scenic Adirondack mountains. Both trains travel along the Hudson River Valley out of New York, past Storm King Mountain and West Point Military Academy, a very scenic route, highly recommended. See the Train travel in Canada page for train times. Amtrak's daily City of New Orleans links these cities, with Superliner seats, sleeping-cars, sightseer lounge and dining-car. For times, fares and online booking, see www.amtrak.com. Regular trains link Los Angeles, Anaheim (for Disneyland), and San Diego. Regular trains link San Francisco (Oakland) with Sacramento, Bakersfield and San Jose. A daily train links Los Angeles with San Francisco (Oakland). See www.amtrak.com or www.amtrakcalifornia.com for times, fares and online booking. Amtrak's daily Coast Starlight links these cities, with Superliner seats, sleeping-cars, sightseer lounge and dining-car. For times, fares and online booking, see www.amtrak.com. Amtrak runs an inter-city service between these cities, see www.amtrakcascades.com - Some of these services use European-design Talgo trains. Luggage on trains without checked baggage: Some of these trains don't have checked baggage, you simply take your luggage with you onto the train and put it on the racks just as you would on any European train. Generous limits apply - 2 items each up to 23Kg, plus two smaller personal bags each up to 11Kg, see www.amtrak.com/baggage-policy. Short distance trains come in various types, all with comfortable air-conditioned seating and often with a café car. On the Boston-New York-Washington DC route, there is now the premium fare, 150mph Acela Express high speed train, based on French TGV technology, but running on conventional tracks. Long-distance trains east of Chicago (such as the New York-Chicago Lake Shore Limited, the New York to Florida Silver Star & Silver Meteor or the New York to New Orleans Crescent, but not the Washington to Chicago Capitol Limited) have Viewliner sleeping-cars, Amfleet reclining seat cars, an Amfleet lounge car serving snacks and drinks, and a heritage dining car serving full meals at very reasonable prices. If you have paid for a sleeper, meals in the dining-car are included in the fare. These distinctive stainless-steel coaches have comfortable reclining seats with loads of legroom, drop-down tables & 120v power sockets for laptops & mobiles. Drinking water is available in each coach. Unlike in Europe, your reservation does not secure a specific seat in a specific coach, you can sit where you like once on board. An attendant looks after each seats car, and will place a 'seat ticket' above your seat to indicate that the seat is taken. Amfleet cars. This is the New York to Chicago Lake Shore Limited at its service stop in Albany, after a scenic run down the Hudson river valley. It'll reach Chicago's impressive Union Station next morning. 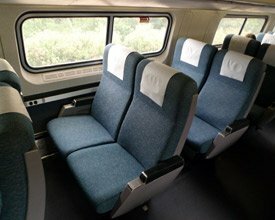 Reclining seats on long-distance Amfleet cars. There's loads of legroom, 120v power sockets for laptops & mobiles, drop-down tables. 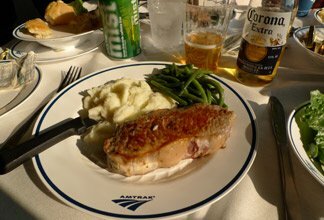 The most important Amtrak long-distance trains such as the Lake Shore Limited and Crescent have a dining-car (the two notable exceptions are the Cardinal & Silver Star which only have cafe cars). These stainless-steel dining-cars date from the 1950s, but they have been fully refurbished inside. The dining-car is open to all passengers, both coach class & sleeper. Meals are included for sleeper passengers (although drinks are extra), but must be paid for by coach class passengers. There are usually several sittings for dinner, for example at 5pm, 5.15pm, 7pm or 8pm in the case of the New York to Chicago Lake Shore Limited. The dining-car manager will come down the train (starting with the sleepers) to take dinner reservations for your chosen sitting. Note that couples and singles won't get a whole 4-seat restaurant table to themselves, you'll normally be seated with other passengers, a great chance to meet people even if you're travelling solo. The food is surprisingly good: The herb-roast chicken & rice (around $15) was a good choice, and for breakfast next morning a cooked breakfast of eggs, bacon & potatoes (around $9 including fruit juice & coffee) hits the spot. A domestic beer costs around $5, premium beer $6, a half bottle of very good Cabernet Sauvignon or Merlot costs around $14. There is also a children's menu. Credit cards are accepted. You can find sample menus on the Amtrak website www.amtrak.com, click 'plan' then look for 'meal & dining options. From June 2018, sleeper passengers on the Lake Shore Limited (NYC-Chicago) & Capitol Limited (Washington-Chicago) will get a tray meal served in their compartment or in a lounge area rather than use the dining-car. Heritage dining car. The restaurant car on the New York to Chicago Lake Shore Limited, serving dinner & breakfast. This stainless-steel 'heritage' dining car dates from the 1950s, refurbished to modern standards. Roomettes (previously called standard bedrooms): Each Viewliner sleeping-car has ten very compact 2-berth compartments called 'Roomettes' arranged either side of a central corridor. They're just big enough for two seats facing each, and at night the seats pull together to form the lower berth, an upper berth drops down from the ceiling. The beds are alongside the windows, and take up most of the room! Roomettes have a fold-out washbasin, concealed toilet (your companion may have to leave the room while you use it) & fold-out table. There is a shower at the end of the corridor. Bedrooms (previously called deluxe bedrooms): Each Viewliner sleeping-car has two Bedrooms, which are much larger than roomettes, and they have a private shower & toilet. Bedrooms have freestanding chair & sofa in daytime mode, and upper & lower berths at night. The lower berth is extra wide, almost a double bed by UK standards! Special bedrooms: Similar to a bedroom, with private shower & toilet, but fully wheelchair-accessible. 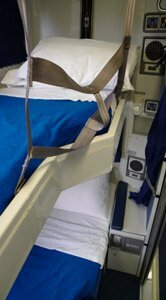 Each Viewliner sleeping-car has one Special Bedroom. Viewliner sleeping-car with its distinctive double row of windows. Light & airy, even the upper berths get a window! 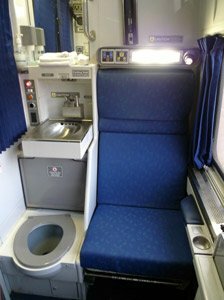 Viewliner Roomette showing the toilet lid open & the drop-down sink folded out. All of life's necessities in a very small space! Viewliner Roomette in night-time mode. The door to the central corridor is on the right. 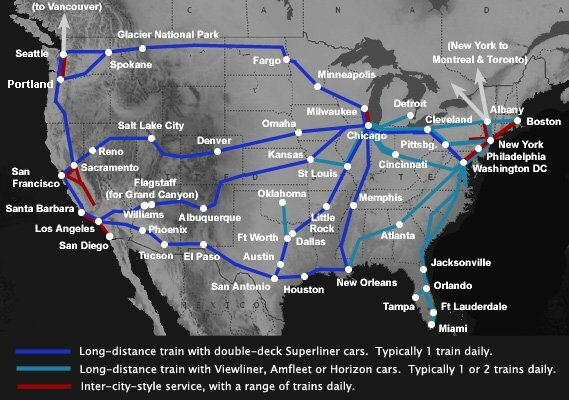 Long-distance trains between Chicago & Los Angeles/San Francisco/Seattle/Portland, also the New Orleans-Los Angeles Sunset Limited, Seattle-Los Angeles Coast Starlight and Washington DC-Chicago Capitol Limited use impressive double-deck Superliner cars. 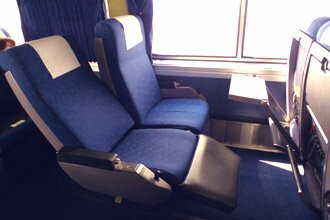 Superliner trains have coach class reclining seats, sleeping-cars, a dining car & an observation-lounge car. A route guide is available free on these trains, telling you want to look out for along the way. 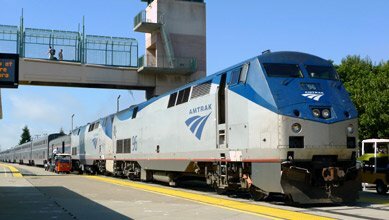 Watch a video guide to Amtrak Superliner trains. Coach class reclining seats are spacious with lots of legroom, comparable with business class on an airliner. 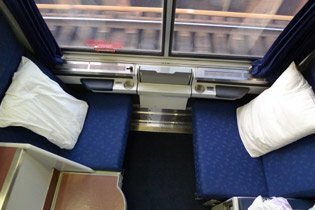 Don't worry if you can't afford a sleeper, these seats recline to about 40 degrees, and are quite easy to sleep in, in fact if there is any train in the world where I wouldn't much mind not having a sleeper, Amtrak trains are the ones I'd choose. There are 120v power sockets for laptops & mobiles at each seat, and drinking water is available in each coach. Unlike in Europe, your reservation does not secure a specific seat in a specific coach, you can sit where you like once on board. An attendant looks after each seats car, and will place a 'seat ticket' above your seat to indicate that the seat is taken. You can either bring a blanket or buy an Amtrak blanket from the lounge car. Panorama photo of Superliner coach class. Superliner cars... Even in coach class these double-deck cars are spacious and comfortable. This is the California Zephyr from Chicago to Oakland (San Francisco), at a station stop at Galesburg. On the upper deck is an observation lounge with armchairs & tables and huge windows for sightseeing. On the lower deck is a cafe selling drinks & snacks. All passengers can use the lounge car, whether they are travelling in coach class or in the sleepers. You end up spending most of your day here, watching America unfold in front of you! Seats are available on a first-come, first served basis, but it's not usually too difficult to find a seat or two free. However, they do fill up for the most scenic sections of the journey! 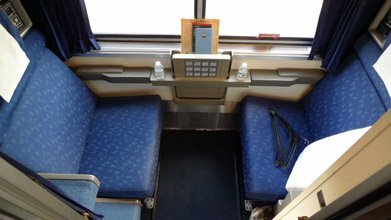 See panorama of a Superliner lounge car. Superliner Sightseer lounge car. 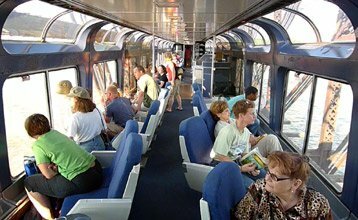 Pictured above left, passengers look out of the lounge car's huge windows as Amtrak's California Zephyr from Chicago to San Francisco crosses the Mississippi river, and so enters America's Wild West... You see it all from Amtrak, but nothing from 35,000 feet! 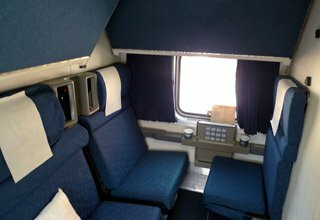 Panorama photo of a Superliner lounge car. 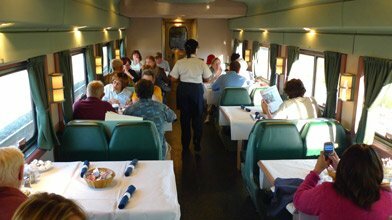 Like the lounge car, the dining-car is open to all passengers, both coach class & sleeper, for breakfast, lunch & dinner. Meals are included in the fare if you have a sleeper (although drinks are extra), but must be paid for if you're in coach. However, the food isn't expensive, so treat yourself. 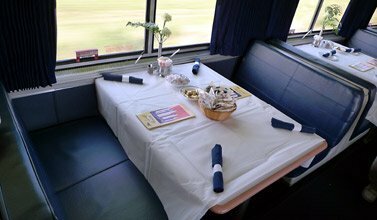 All the tables in a Superliner dining-car are on the top deck for great views while you eat - the kitchens are downstairs. In the sleepers, the dining-car manager comes down the train asking each passenger which sitting for lunch or dinner they'd like, and issuing table reservations. An announcement is made at the start of each sitting. In coach, a steward may also come down the car asking if you'd like to reserve a seat for lunch or dinner, or you can simply go along to the diner at meal times and ask if a table is free. If one isn't available, they may take your name and announce when your table is ready over the p.a. Note that couples and singles don't get a whole 4-seater restaurant table to themselves, you'll normally be seated with other passengers. This is a great chance to meet people, even if you're travelling solo. Panorama photo of Superliner dining-car. What's the food like? The food is surprisingly good: The Angus Steak Burger (around $8) is great for lunch, for dinner the herb-roast chicken & rice ($14) is good and the garlic butter marinated New York Strip Steak (around $24) is excellent. A beer costs around $5, a half bottle of very good Cabernet Sauvignon or Merlot costs around $14. For breakfast next morning a freshly-cooked breakfast of eggs, bacon & potatoes ($9 including croissant, fruit juice & coffee) hits the spot. There is also a children's menu. Credit cards are accepted. You can find sample menus on the Amtrak website www.amtrak.com, click 'plan' then look for 'meal & dining options'. The Garlic-Marinated New York steak... Not bad! Superliner dining-car set for lunch. Roomettes (previously called standard bedrooms): Roomettes are just big enough for two seats facing each other with a small table by day and 2 berths at night. Toilets are available along the corridor and there's a shower cubicle on the lower deck. There are ten roomettes on the upper level, and four downstairs, arranged either side of a central corridor. 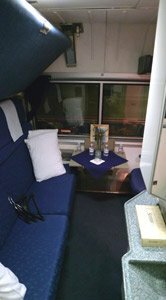 Panorama photo of Superliner roomette. Bedrooms (previously called deluxe bedrooms): Bedrooms are much larger than roomettes, and have an en suite shower and toilet. All five bedrooms in each car are on the upper level, off a side corridor. 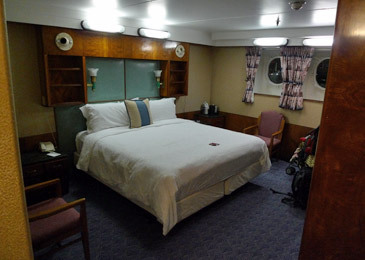 Bedrooms have freestanding chair and sofa in daytime mode, and upper and lower berths at night. Like the Viewliner bedrooms, the lower berth is extra wide. Panorama photo of Superliner deluxe bedroom. Family bedroom: Located at one end of the lower level, taking up the full width of the car, the family bedroom has two adult beds and two child beds. There is no shower or toilet in a family bedroom, but these are nearby outside the room. Special bedroom: Located at the other end of the lower level, also taking up the full width of the car, the special bedroom is wheelchair accessible, with two berths & private toilet. 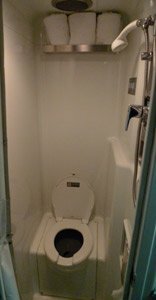 There is no shower in a Superliner special bedroom, but a (non-wheelchair-accessible) shower is just outside the room. Superliner Roomette... The photo shows its size, it's just big enough for two comfy seats facing each other. 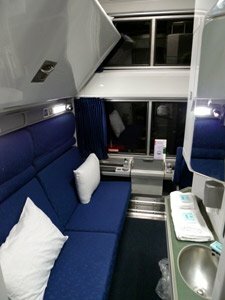 At night, the seats pull together to form the lower berth, which takes up most of the room, and the upper berth folds out from the wall above the window. Washrooms, toilet & a hot shower are just along the corridor. See panorama photo. Family Bedroom, in daytime mode... It takes up the full width of the car at one end of the lower deck, and has a sofa and jump seat that becomes 2 adult & 2 child berths at night. Toilets & a shower are nearby. 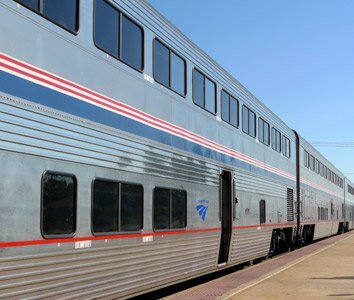 Video guide: What's it like on board an Amtrak Superliner train? There are two main ways to reach the Grand Canyon as part of a transcontinental train trip, after you get off Amtrak's Chief at Flagstaff Arizona. The first is to use a bus between Flagstaff and the South Rim of the Canyon, journey time 1 hour 45 minutes each way. The other is to take a connecting Amtrak Thruway bus to the nearby town of Williams and use the historic Grand Canyon Railway to the Canyon, journey time 2 hours Williams to the South Rim. Scheduled buses link Flagstaff's Amtrak station (which also incorporates the excellent local Visitor Centre) with the Grand Canyon's South Rim, with an 8am bus departure from Flagstaff conveniently connecting out of Amtrak's Chief from Los Angeles arriving at the Grand canyon around 1 hour 45 minutes later. A bus returns from the Grand Canyon at 6.15pm (also at 4.15pm from March to October), arriving back in Flagstaff 1 hour 45 minutes or so later. It can easily be done as a day trip, returning to Flagstaff in time for the evening Chief to Los Angeles, although you can of course choose to stay overnight at the hotels at the Grand Canyon. For bus times, see www.arizonashuttle.com. The bus fare is around $28-$30 each way. 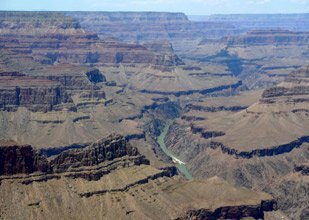 Grand Canyon Tours from Flagstaff: Alternatively, take a tour. A company called The Grand Canyon Store http://grandcanyoncustomtours.com offers 1-day tours from both Flagstaff & Williams to the Grand Canyon, including a tour to the Grand Canyon Village & South Rim, and the more extensive Inner Canyon Tour that actually takes you to the Colorado River at the bottom of the canyon, not merely to the South Rim as with other tours and the scheduled bus - not surprisingly the Inner Canyon Tour is their most popular! They also do a tour from Flagstaff to the South Rim using the Grand Canyon Railway, see the section below. 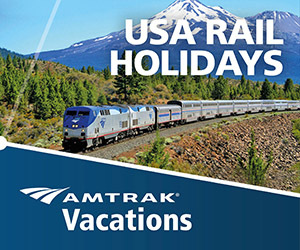 www.amtrakvacations.com can put together an Amtrak coast-to-coast package for you with a stopover at the Grand Canyon, or a tour from Los Angeles to the Grand Canyon and back, customised you your specification. See Grand Canyon packages. The more interesting way to reach the Canyon is on the Grand Canyon Railway from Williams to the Canyon's South Rim. This is the original Santa Fe railroad branch line, Williams Junction just outside Williams town is where the line diverges from the Chicago-LA main line. However, Amtrak's Southwest Chief no longer calls at Williams Junction (it called there at uncivilised times in any case), you now use Flagstaff as the stop for the Grand Canyon with Amtrak bus connection to Williams. 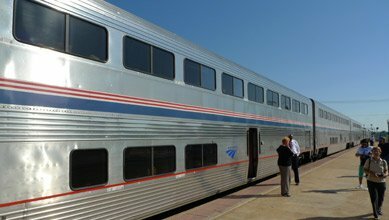 To reach the Grand Canyon by train, get off the Amtrak's Chief at Flagstaff and take the connecting Amtrak Thruway bus to Williams. The buses are timed to connect with train's arrival & departure to and from both Chicago and Los Angeles. Williams is a pleasant town with plenty of motels, shops & diners. The Grand Canyon Railway runs a daily morning train some 65 miles over the Santa Fe's historic railway from Williams station to Grand Canyon South Rim station in the Grand Canyon Village, right on the edge of the Canyon's South Rim. The train returns in the afternoon, arriving in time to have dinner then catch the shuttle bus to Flagstaff for Amtrak's Chief onwards to Los Angeles. The Amtrak reservation system at www.amtrak.com will actually let you buy through tickets between Los Angeles and Grand Canyon in either direction, although if you want to book through tickets between New York or Chicago and Grand Canyon this involves an overnight stay in Williams so you'll need to use the multi-city booking feature. But you can book your Amtrak trains at www.amtrak.com then book the Grand Canyon train at the GCR official website, www.thetrain.com. You can also book Chicago-LA packages with Amtrak travel and a trip to the Grand Canyon on the Grand Canyon Railway at www.amtrakvacations.com, Amtrak's official partner for tours and packages involving Amtrak travel. See Grand Canyon packages. The fare includes entry to the Wild West show at Williams station in the hour before departure, and some Wild West entertainment on board! The Grand Canyon. This is the view from the south rim, just 3 minutes walk from the station. 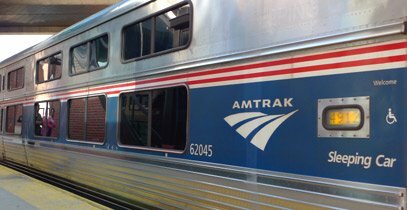 One of the best ways to see America is with an Amtrak USA rail pass, just be aware of its limitations before you invest in one. A 15-day (maximum 8-segment) rail pass costs £315 or $449. A 30-day (maximum 12-segment) rail pass costs £476 or $679. A 45-day (maximum 18-segment) pass costs £616 or $879. Children aged 2-12 get passes for half price, under 2's travel free. Segments: Sadly, since 2008 Amtrak's USA railpasses no longer give unlimited travel. They only cover a maximum of 8, 12 or 18 'segments' depending on your pass duration. This is the maximum number of individual train rides you can take during your 15, 30 or 45 day pass duration. A segment is one train ride on one train, so a 2-day trip counts as one segment, and so does a 30-minute one! A journey involving a change of train counts as two segments. Will a railpass save you money? Very probably, if you intend making 8 or more long-distance train rides. Here's the maths: Depending on which pass you buy, a railpass works out at $47-$54 per segment assuming that you use it for the maximum 8/12/18 segments. For comparison, a point-to-point ticket from New York to Chicago costs $86 if you book in advance or maybe $105 bought on the day. Chicago to Denver costs $97 in advance or $146 on the day; San Francisco (Oakland) to Los Angeles costs $61; New York to Washington DC costs $49 in advance or up to $106 on the day. In other words, as long as you are making 8 or more train rides, and making long-distance journeys rather than many short hops, a pass is likely to save you money. If you only intend making two or three train trips, or only making very short trips, then ordinary tickets are likely to work out cheaper. 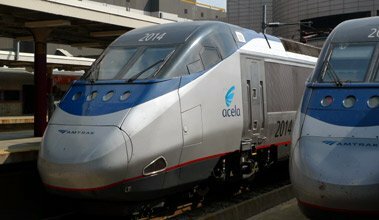 Railpasses are valid for any Amtrak train in the USA except Acela Express high-speed services and the Auto-Train car-carrying service. Reservations are still required! The railpass is not a ticket, you must make a (free) reservation before boarding any train. You can make reservations as you travel around the States at stations or by calling Amtrak's 24 hour freephone number, 1-800-USA RAIL. Alternatively you can make some or all of your reservations in advance from outside the States by calling Amtrak on (001) 215-856-7953. Upgrading to a sleeper: If you want to travel in a sleeping-car room, you need to pay the appropriate room charge in addition to your rail pass. For an idea of sleeper room charges, see the fares section above. Warning about passholder quotas: Although in theory you can make a reservation with a railpass even on the day of travel, trans-continental trains get busy in summer & at Thanksgiving, for example, and passholder places are limited by quota. This quota for railpass holders is reportedly set to zero when a train becomes 75% full. In other words, you buy a pass and they then have your money, but when you try and use it you may be told all the trains are 'full' for railpass holders even though seats remain available for customers paying cash. So don't fall into this trap. At busy times of year (summer, Christmas, Thanksgiving) I'd recommend either buying your pass and reservations together from an agency by phone (so if there are no seats available on the trains you want, you don't buy the pass) or simply booking regular point-to-point tickets online which include a confirmed reservation. They are the Amtrak tour & vacation specialists, so know what they're doing, see the Amtrak Vacations section above. Train travel specialist Railbookers can arrange a tour by train across the United States on Amtrak, starting any date you like, to your own specification with hotels and train reservations all made for you, hassle-free. They know what they're doing, and take good care of their clients, and I have no hesitation in recommending them. Coast-to-coast escorted tour with www.greatrail.com, 01904 527 120. If you want to go coast-to-coast across the United States or Canada by train, but would rather do this as part of an all-inclusive organised tour with other travellers and a guide, UK-based company Great Rail Journeys (www.greatrail.com) offers 5-star rail-based holidays from about £2,500 per person. They also offer rail-based holidays to other countries. Check the holiday details online, then call 01904 527120 to book or use their online booking form. Seat61 gets some commission to help support the site if you book your holiday through this link and phone number. To get the most from a visit to the USA, you'll need a good guidebook. For the independent traveller, I think this means either the Lonely Planet or the Rough Guide. I personally prefer the layout of the Lonely Planet, but others prefer the Rough Guide. Both guidebooks provide the same excellent level of practical information and historical background. You won't regret buying one of these..! Seat61 gets a small commission if you buy through these links. For a specific guide to train travel around the States, buy a copy of John Pitt's USA by Rail, or see www.usa-by-rail.com, or try Jim Loomis's All Aboard. 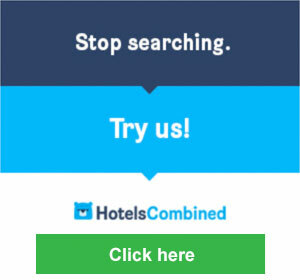 www.hostelworld.com: If you're on a tight budget, don't forget about backpacker hostels. Hostelworld offers online booking of cheap private rooms or dorm beds in backpacker hostels in many places across the States at rock-bottom prices. 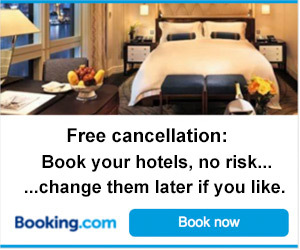 Washington DC: Phoenix Park Hotel. A great choice, directly across the road from Union Station so handy for arrivals and departures by train, with an excellent Irish Pub doing great food & Irish beer on the premises, and just 2 minutes walk from the capitol. From around $154 for a double. 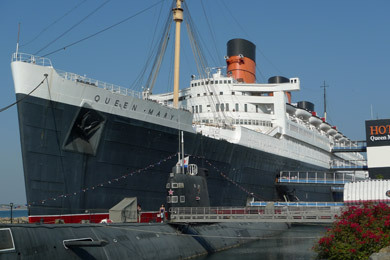 Los Angeles: Hotel Queen Mary. This has got to be of the most fascinating places to stay, anywhere. If you go to Los Angeles, consider making the Hotel Queen Mary your base to explore the Los Angeles - Hollywood - Disneyland area. The original Queen Mary of 1936 has been permanently moored at Long Beach in California since the late 1960s, some 25 miles from Los Angeles Union Station (about a $90 taxi ride), and it's undoubtedly the most wonderful place to stay in LA. The hotel consists of most of the original first class cabins on board the Queen Mary, and there are plenty of restaurants and bars available on board, too. Hotel guests can more or less wander the ship at will, and even sign up for ghost hunts at night on board (and yes, from my own experience there is something going on on that beautiful ship!). Wood panelled art deco interiors have been preserved, although a few modern items have been installed such as televisions, and (as we worked out from a historic deck plan) in some cases two of the Queen Mary's original cabins have been knocked into one hotel suite by turning one of the en suite bathrooms into a connecting corridor. She is one of the most atmospheric places I have ever stayed. Make the airport experience a little more bearable with a VIP lounge pass, it's not as expensive as you think, see www.loungepass.com. I have found that having lounge access with complimentary tea, coffee, food and wine makes all the difference to an economy flight.